First published in Wanted Magazine December 2017. Whisky, the so-called nectar of the gods (justifiably so! ), originated in Ireland and Scotland, where over centuries it was passionately nurtured from humble beginnings to the globally popular drink that it is today. We browsed through the collections of these two countries to find a few of the best. The Glenlivet, Scotland’s first licensed distillery and industry groundbreaker, is synonymous with Scotch whisky and its history. ‘’THE Glenlivet is THE ORIGINAL’’, says South African brand ambassador Isaac Pooe. ‘’It’s been the Original Speyside Single Malt since 1824, setting the benchmark in taste, heritage and exploration ever since. This is the reason I enjoy hosting private tastings so much – I get to reveal the story behind our whisky, and the tenacity of George Smith, the founder, whose passion for his craft made me fall in love with whisky in the first place’’. At the helm since 2009, Master Distiller Alan Winchester has ushered in a raft of progressive expressions from the Guardians’ Chapters and the Alpha to the extension of the Nadurra range, helping to entrench the brand as one of the world’s leading single malts. It’s the inception of Founder’s Reserve though that’s been the most compelling development of recent years: a multi-vintage whisky that triumphs in the ambitious trifecta of affordable, accessible, and interesting. Equally special amongst the country’s gems is Aberlour (pronounced Aber-lauer). Founded by James Fleming in 1879, there’s a deep sense of continuity and tradition at this distillery. The acclaimed A’bunadh, a mouthful in every sense, was recreated from a bottle dating back to 1898. And distilling chief Douglas Cruickshank, along with most of his team, has been forging these exceptionally balanced whiskies for some 25 years, not least the metronomic 12YO. Across in Ireland it’s single pot stills that preside, rather than single malts. This once dominant style, made from both malted and unmalted barley, is staging a rousing comeback, led by the Midleton Distillery. Crafted by a team under various “Masters” including Billy Leighton (Blending) and Brian Nation (Distilling), Midleton’s muscular pot still portfolio is making the rich, fruity and spicy band of the flavour spectrum its own. The backbone of the style, especially during its hiatus, Redbreast is now the world’s best-selling single pot still. The range numbers five delicious, aged expressions, but the 12YO remains the paterfamilias, exercising authority over both its stable and style with sheer force of character and weight of credibility. Nose: A complex spicy and fruity aroma with toasted wood notes evident. Palate: Full flavoured and complex; a harmonious balance of spicy, creamy, fruity, sherry and toasted notes. Finish: satisfyingly long, the complex flavours linger on the palate. The Spot Whiskeys were named after the method of identifying the age of the casks used for their maturation i.e. by daubing them with a spot of coloured paint. Yellow Spot, with its unusual mix of Bourbon, Sherry and Malaga cask influences, delivers a succulent sweetness is that is almost uniquely special. Nose: Mown hay & cracked black pepper. Red bell peppers, nutmeg, clove oil & green tea. Sweet honey & peaches from the Malaga casks. Palate: Honey sweetness with pot still spices. Flavours of fresh coffee, creamy milk chocolate & Crème Brûlée. Notes of red apples & toasted oak. Finish: Sophisticated & complex with a sweetness throughout. a mix of red grape & dry barley on exit. Powers whiskey dates back to 1791 when James Power established a distillery at John’s Lane in Dublin. Since then it’s built a reputation for bold to bursting, flavoursome whiskeys, one of latest exponents being the Signature Release. Nose: Crisp herbal notes with touches of nutmeg, fig and black pepper corns. Sweet vanilla, followed by succulent berry fruits. Palate: Vanilla with black licorice and cinnamon reveal fresh fruit – melons, green apples and pears – followed by crisp barley. Finish: Long and wonderfully complex honey and spice. Its eponymous brand is also the distillery’s most premium, with good reason. Whereas the others are overtly demonstrative, Midleton runs to subtlety, complexity and refinement. The Barry Crockett Legacy takes its name from the distillery’s long serving, now retired Master Distiller, a pivotal figure in the resurgence of Irish whiskey. Nose: Elegant aroma of vanilla and toasted oak complimented by a touch of lime, succulent green berries, pears and green sweet pepper. Palate: Light pepper carries onto fresh citrus, limes and mandarin orange sweetness. A hint of cinnamon with vanilla and oak reveals its years spent in American oak. Finish: The full spectrum of flavours lasts well into the finish, slowly fading to expose the clean American oak foundation. They arguably own as much of the whisky heritage as any producer. 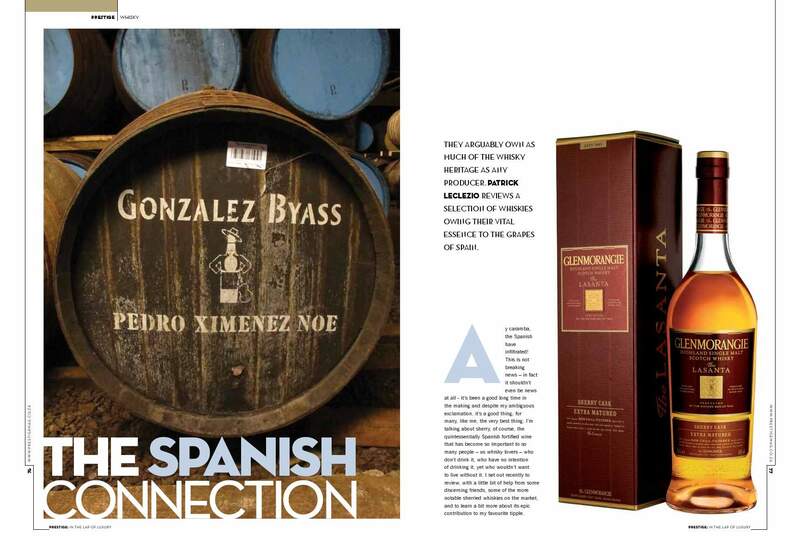 Patrick Leclezio reviews a selection of whiskies owing their vital essence to the grapes of Spain. First published in Prestige Magazine (June 2015 edition). Ay caramba, the Spanish have infiltrated! This is not breaking news – in fact it shouldn’t even be news at all – it’s been a good long while in the making. And despite my ambiguous exclamation, it’s a good thing; for many, like me, the very best thing. I’m talking about sherry, of course, that quintessentially Spanish fortified wine, that has become so important to so many people – us whisky lovers – who don’t drink it, who have no intention of drinking it, yet who wouldn’t want to live without it. I set out recently to review, with a little bit of help from some discerning friends, some of the more notable sherried malt whiskies on the market, and to learn a bit more about sherry’s epic contribution to my favourite tipple. One is often told – cut to an industry emissary assuming a portentous tone – that whisky is made from only three ingredients: barley, water and yeast. Deep (not really – I’m just paying homage to the pregnant pause that usually follows), but also misleading. It may be true in terms of direct ingredients, but that’s only part of the story, luckily, otherwise our noses and palates would be bored stiff. There are other ingredients that have come to play a part, peat and oak notably, and, acting in synergy with the oak, a variety of other drinks, of which bourbon and sherry are overwhelmingly the most significant. It may be worth taking a moment to contextualise matters. The single most important factor influencing the flavour of a whisky, undisputed and empirically proven, is the maturation (or ageing) of the spirit, which itself, for the most part, is constituted of three essential, equally vital elements: time, wood, and the sherry or bourbon in which the oak was seasoned. It’s a subjective view on which some may differ – you have to make up your own minds – but I would venture that of the two sherry is by far the more interesting. By this reasoning then – I don’t think I’m being dramatic – it is critical to whisky. There are a few distinct sherries primarily used by the whisky industry for the seasoning of its casks, each of which imparts a different influence to flavour. Oloroso: The most popular sherry for whisky maturation. An oxidatively aged sherry – which means that it matures in contact with air. Dark, nutty, often sweet. Pedro Ximenez (PX): Increasing in popularity. Pressed from dried grapes, thereby concentrating its sugars. Intense raisin and molasses. Very sweet. Fino: A biologically aged sherry, covered during maturation by a cushion of yeast known as flor, which prevents contact with air. Light, fresh and dry, with no oak influence. Others: Amontillado and Manzanilla casks are also rarely but occasionally employed. Strangely, having said this, the importance of sherry to whisky is not endorsed in the regulations (I refer to those for Scotch whisky), which only require whisky to be matured in oak casks. Its use exists purely on the basis of accident (like so much with whisky), convention, and its own considerable merits – enough in itself. The origins of the relationship lie in the reuse of the casks that transported sherry from Spain to Britain (an idea stemming from the prudent Scots no doubt), to hold and store whisky for merchants and wealthy customers, who subsequently discovered a beneficial influence on the liquid. The practice was accordingly perpetuated and by the end of the eighteenth century distilleries had begun to mature their whiskies in this fashion as a standard. Today these transport casks have been replaced by bespoke casks – casks seasoned with sherry on instruction, for a prescribed period of usually between one and half to two years. The resultant variety of flavour is attributable to the different types of sherry, but also to the different types of wood being used. This is sometimes overlooked by much of the whisky community, which often refers to sherry casks and European oak interchangeably – a gross mistake. Casks seasoned with sherry are made from both American oak and European oak, and have been for much of history, the latter mostly of Spanish oak, but possibly of French oak or of other types. The same sherry in one or the other has a markedly different result for the whisky end-product. Even the same sherry in the same wood, being organic and imbued by nature with its own individuality, will produce varied results, albeit less markedly. It’s a truly synergistic process where sherry, wood and whisky interact in a process where the resultant cask will be absolutely unique. These insights could be evidenced in much of the selection that we reviewed. The pool, not comprehensive by any means, but as representative a collection of reasonably priced sherried whiskies as was possible and practical, was as follows: Aberlour 16YO, Balvenie 17YO Doublewood Bunnahabhain 18YO, Glendronach 12YO, Glendronach 16YO Platinum, Glenfiddich 18YO, Glenmorangie Lasanta, Highland Park 12YO, and Macallan Sienna. There isn’t a whisky amongst the lot that I wouldn’t gladly drink on a daily basis, testament to sherry’s potency if well deployed. The most intense were the two Glendronachs – I could literally feel the tannins tugging gently on my palate. Both exclusively sherry cask matured (combination Oloroso and PX), the 12YO is aged a few years in American oak, but spends most its life in European oak, whilst the slightly more restrained 16YO is entirely matured in European oak. Powerful indeed! They define the term sherry bomb. The most interesting (but also challenging – there’s a lot going on) of the selection is perhaps the Balvenie, matured in both American and European oak (seasoning not specified but I would imagine both bourbon and sherry) and then finished in Oloroso butts for six months. A marvellously complex interplay of the dark dried fruits and spices expected of sherry. Its stable mate, the Glenfiddich, is rich and flavoursome, but less ambitious. The Bunnahabhain 18YO always reminds me of a salted dark chocolate. It’s full flavoured, with notes of cocoa and a hint of salt so subtle that I sometimes think it’s suggested by my visit to the distillery’s spray flecked dunnage, located point blank on the ocean. The Sienna is undeniably a Macallan with all the rounded richness that this entails, offering enough of the Macallans of yore to keep us all interested I’d warrant. It’s fully sherry cask matured in a pleasing, well balanced mix of first-fill American and European oak. The Highland Park was the only peated whisky amongst those we tasted, and it reconfirmed to me the need for sherry as a counterweight to peat, at least for my taste. It remains one of the most complete Scotches on the market. Lasanta, essentially a Glenmorangie Original finished (or extra matured in Glenmorangie parlance) in Oloroso casks for two years, is a striking example of the sherry contribution in general, taking a light, citrusy whisky, and transforming it into something rich and full bodied. I hesitate to use the word favourite with reference to whisky, so I usually don’t and I won’t now. Your appreciation and consequently your evaluation of a whisky can depend I feel on your mood, your environment, and your physiology at a moment in time. 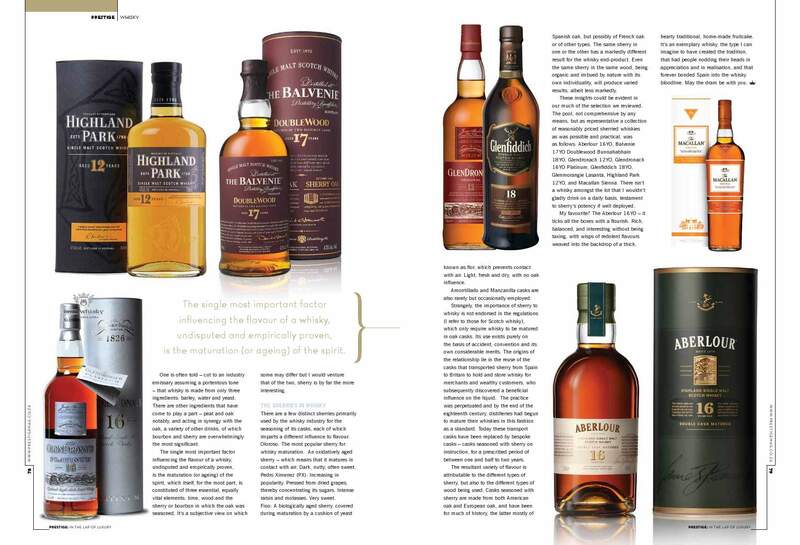 You may have noticed however that I omitted mention of one of the whiskies in the review. Why? Well, I have this thoroughly unscientific test that I’ve used to single it out. After a tasting I unconsciously drink (hmm…don’t make too much of this combination of words) what remains of the bottles over time. Every now and again I take stock of the inventory. In this case the Aberlour 16YO was the first to disappear. Read into it what you will. My simple conclusion is that it ticks all the boxes with a flourish. Rich, balanced, and interesting without being taxing, with wisps of redolent flavours weaved into the backdrop of a thick, hearty traditional, home-made fruitcake. It’s an exemplary whisky, the type I can imagine to have created the tradition, that had people nodding their heads in appreciation and in realisation, and that forever bonded Spain into the whisky bloodline. May the dram be with you.